This feature is the first in a new series detailing the custom motorcycle haulers of our featured builders. Tell us what you think in the comments! If you ride custom or vintage motorcycles, there’s a good chance you’ve had to consider a moto-hauler of some kind. 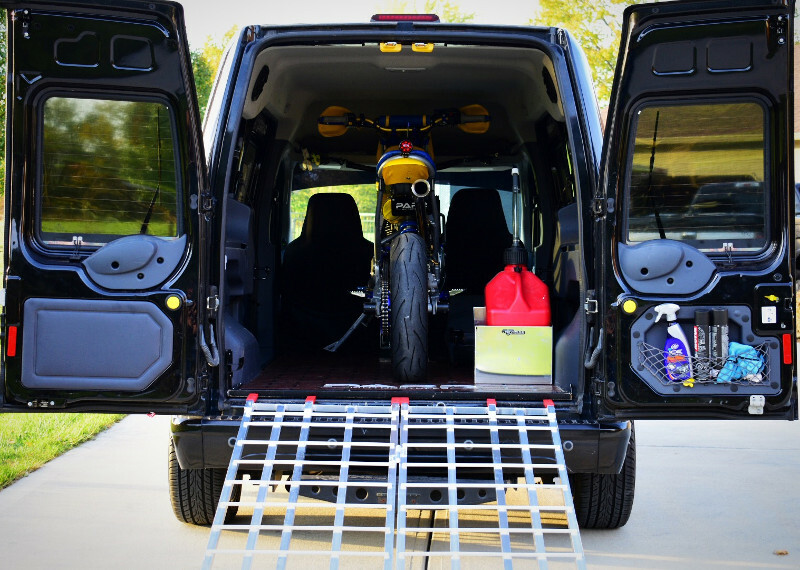 While a pickup truck or trailer can certainly get the job done, it’s hard to beat the allure of the “Moto Van” — a machine that’s easy to load and can keep your bikes and gear safe, secure, and out of the elements. A full-size van can be an unwieldy proposition, but in recent years, the market has seen an influx of compact vans like the Nissan NV200, Ram ProMaster, and most popular of all, the Ford Transit Connect — developed by Ford Europe and imported to American shores since the 2010 model year. Here at BikeBound, we recently found ourselves in the market for a new moto-hauler to replace our single-axle trailer. When he talke dot Bryan Fuller of Fuller Moto, he suggested a Ford Transit. 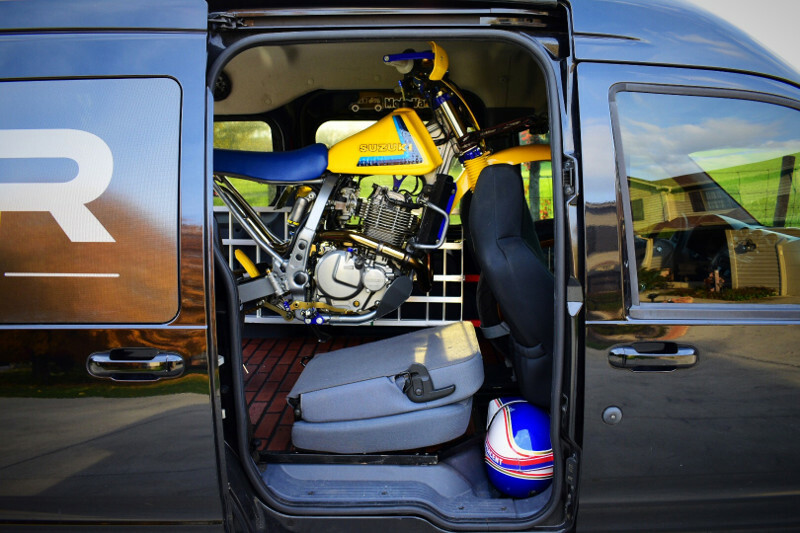 We wondered if the most compact van of the series, the Transit Connect, could haul motorcycles — and if so, just how much motorcycle? The first-gen (2010 to 2013) models have a high roof, solid gas mileage (25 mpg combined), and the market is flooded with cheap, ex-utility examples in the $4500 to $8000 range. 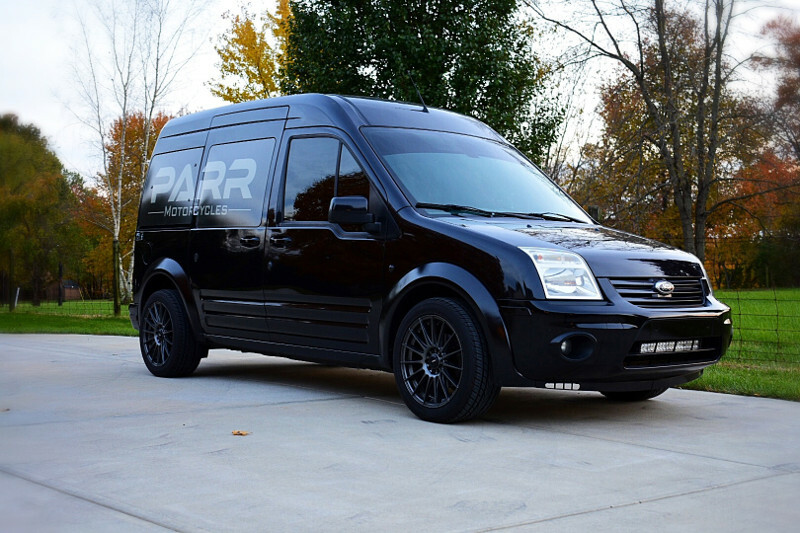 We were unsure of the little Ford’s potential until we saw the blacked-out Ford Transit Connect moto van of Spencer Parr, founder of Parr Motorcycles and builder of one of our favorite builds of 2018, the Retro Moto DR650. With the modifications detailed below, Spencer has transformed his TC into a single bike hauler that gets 25 mph and doesn’t piss off his neighborhood HOA. 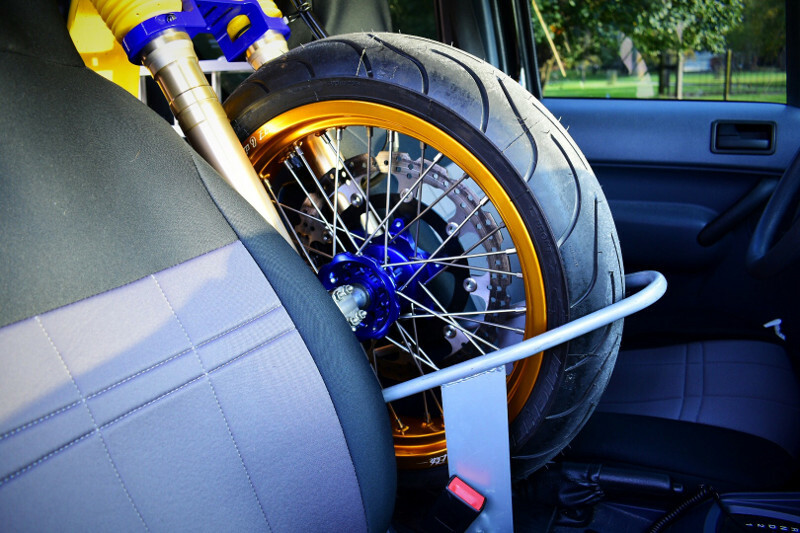 So far, he’s managed to fit a bike 85″ long (H-D XR1200) and 47″ tall (DR650) — both with room to spare. 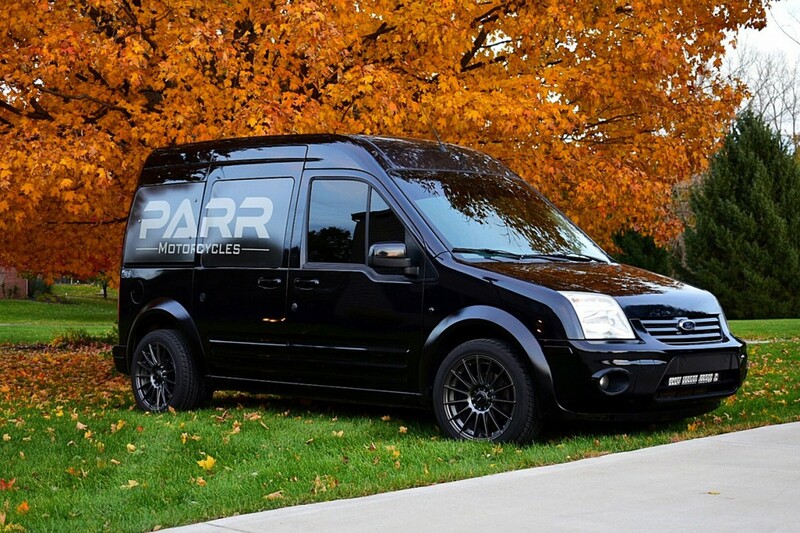 Below, we get the full story on this Ford moto-van! My name is Spencer Parr and I live in Avon, Indiana (west of Indianapolis). My passion for anything with a motor came from my early childhood. I was like most kids that played sports but, on the weekends, I raced. Racing go karts early in my life soon led to other hobbies including motorcycles. Other than dirt bikes, I purchased my first roadworthy motorcycle at age eighteen (Harley Sportster 883). 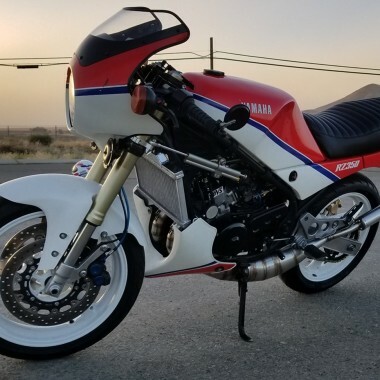 Many and many bikes later, my passion for motorcycles grew. Working on them through the years turned into me building them into one of a kind machines. While building bikes, I was a full-time police officer of 5 years until recently. I was diagnosed with ocular cancer, which led me to be blind in one eye. I got off the road as a police officer and now work as an investigator during the day, and bike builder at night. Today, I operate Parr Motorcycles out of my home garage but hope one day I can get my own shop with some extra hands! 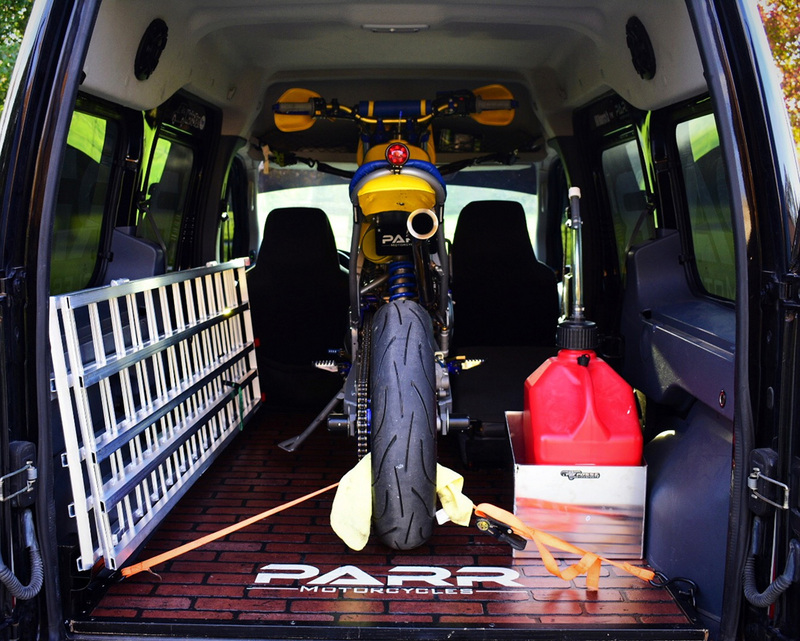 • What’s the make, model, and year of your moto van? 2012 Ford Transit Connect XLT Premium. 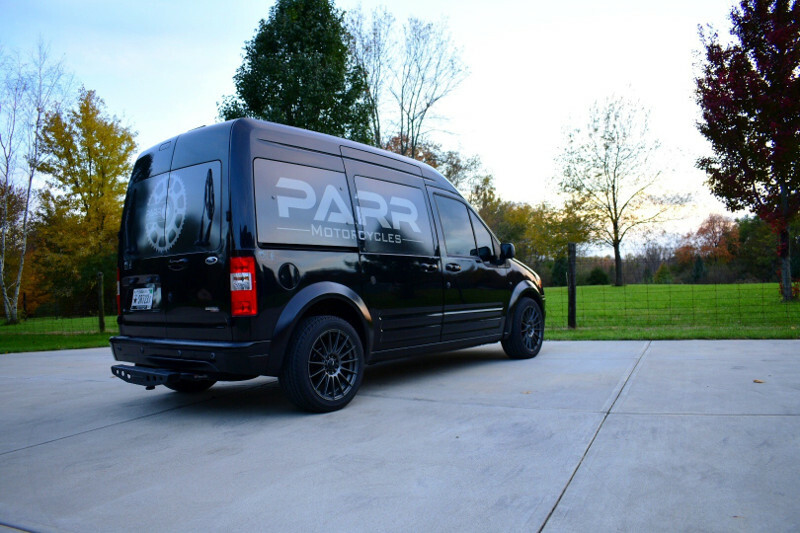 • Why did you choose this van to haul bikes? Before the moto van, I had a nice full-size truck that I loved. At the time, I used my truck and my father’s trailer to haul motorcycles. Being that I didn’t want to drive to my parent’s house to get the trailer all the time, I landed on the idea of a Moto-Van. The idea also came about due to a “No trailer” policy in my neighborhood. When I initially spoke with my family about the idea they couldn’t get past the idea that it’s a van and not a truck. It was a big decision for me, as I’ve always had a truck as a personal vehicle. Even when I was a police officer, my patrol car was my first car I’ve ever had. I needed something with a roof, so I decided to take the plunge and get a Moto-Van. 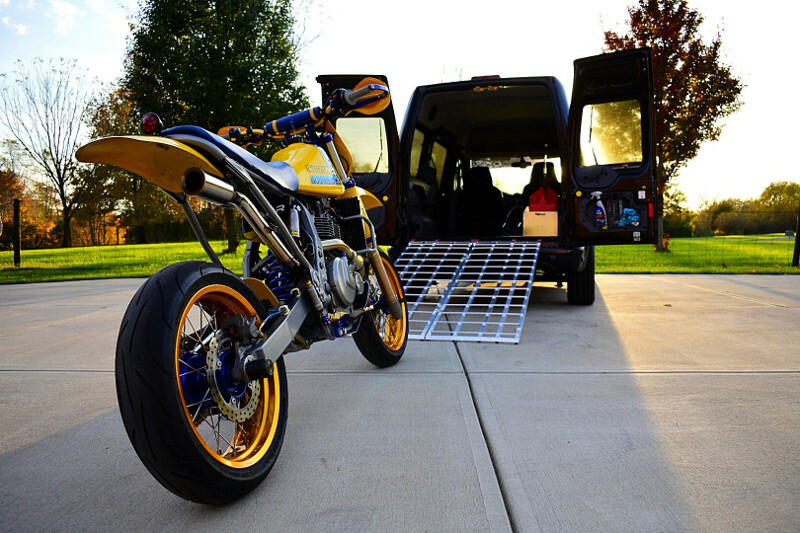 My plan with the Moto-Van is to help me transport my motorcycle(s) to shows in the coming year. I drive to Indianapolis for work every day, so I needed a fuel-efficient van that’s able to park in garages, but still tall enough to haul motorcycles. 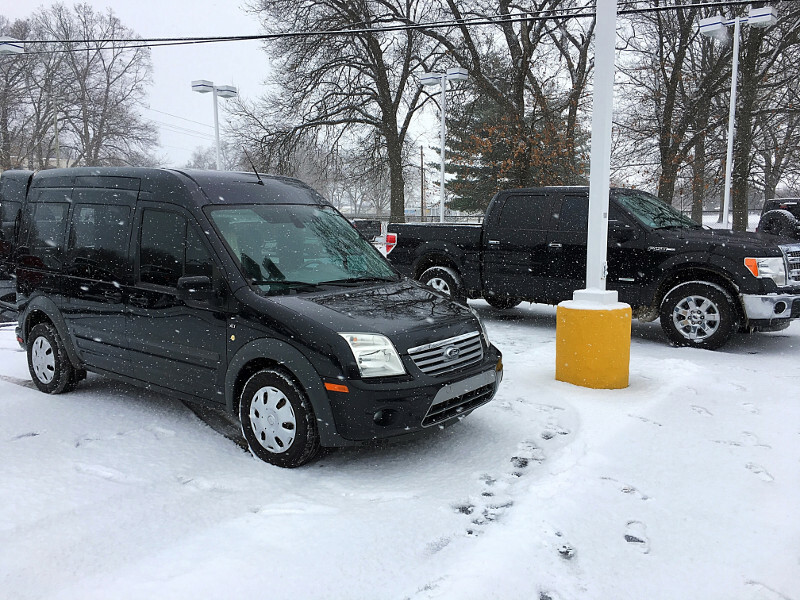 I landed on the 2012 Ford Transit Connect XLT Premium. I did look at newer Ford Transits, but they had a significantly lower roof than the first generations (45” compared to 52”), which matter when hauling different types of motorcycles. The Premium is the passenger version with all the goodies my truck had (electric start, backup camera, Microsoft sync, power windows/locks, folding 2nd row seating, overhead/rear door storage, key fob, daytime running lights and 255 degree opening rear doors (my favorite). My goal with the van is to have a comfortable daily driver that I can fit passengers in, if needed. Also, be good on gas and able to drive through a city with ease. 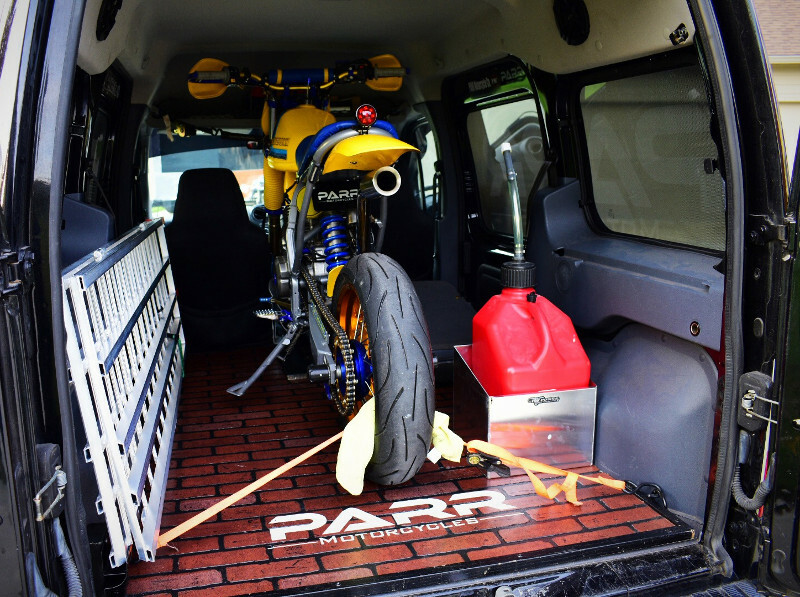 • What modifications did you make to the van to haul bikes? 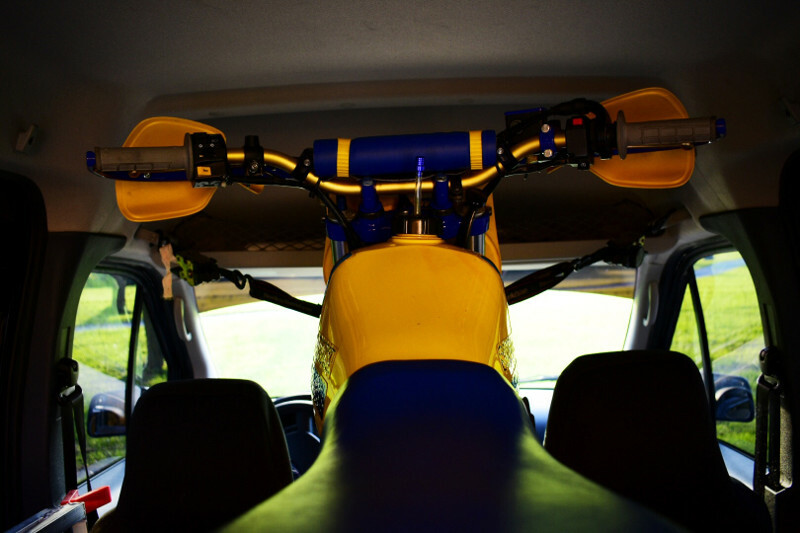 When I got the van, I knew the only way to make it work was to have the forks and front wheel of the motorcycle sit in between the front seats. The seat width is around 9.5’’- 10”. I measured my Harley-Davidson XR1200 and knew it was going to be close. I removed the rear bench seat and rear bucket seat. I first built the wheel chock adapter with a cutout around the parking brake and seat belts from a 1”x 12’’ piece of wood. I had a leftover wheel chock laying around, which actually fit perfectly. To mount the wheel chock in the van, I used the existing rear bench seat mounting bolts. The wheel chock was also reinforced for the weight of the motorcycle on the center console. I then built a platform for the flooring in the cargo area. 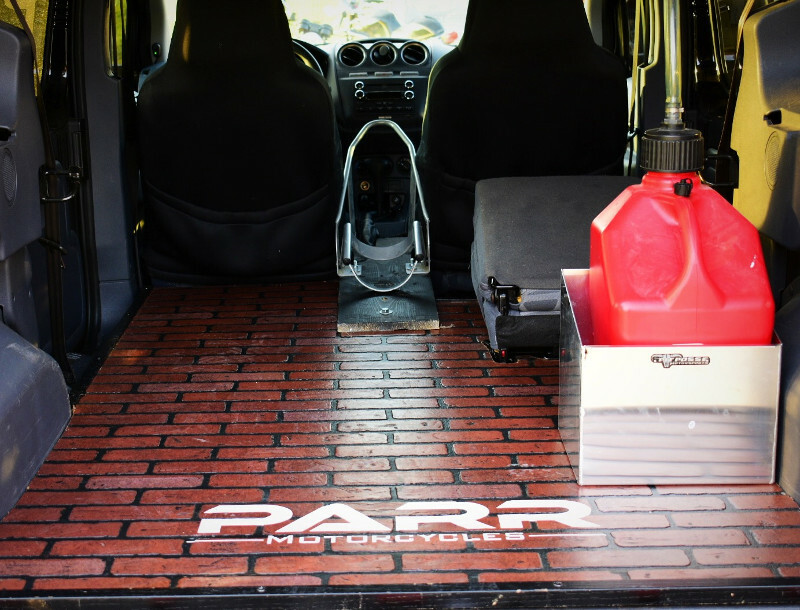 The van’s flooring would not work due to it stopping right before the rear passenger footwells. I purchased a ¾” piece of plywood and cut out the flooring to make room for the fender wells and bucket seat. 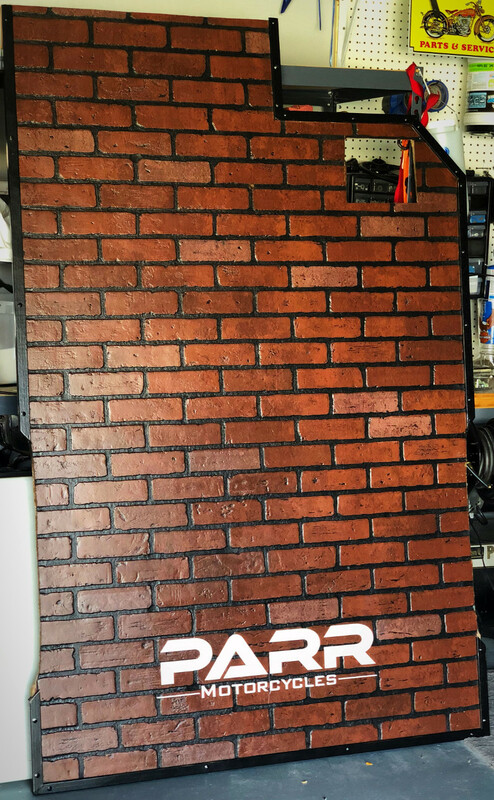 Instead of going with wood flooring on top of the plywood, I went with a 4×8’ sheet of Red Brick hardboard wall paneling which adds character and traction to the floor. A decal was placed on the rear section and I polyurethaned the floor to help with scratching. Molding was added around the flooring to clean up the look. To load a bike, the only thing I need to do is install the wheel chock and that’s it. It has worked out great so far. While my current platform works great, in the future I may design a system where I don’t need to remove the wheel chock after use. • How easy is load in/out? Do you have to compress the forks or fit bikes diagonally? To load, the process is simple. Only thing I have to do is install the wheel chock and the bike is ready to load. I use a Black Widow Aluminum Bi-Fold ramp (6’ L x 44” W), which is light and easy to operate. Once the bike is loaded, I mount the ramp inside the van with hangers I made to conserve space and hold the ramp in place. 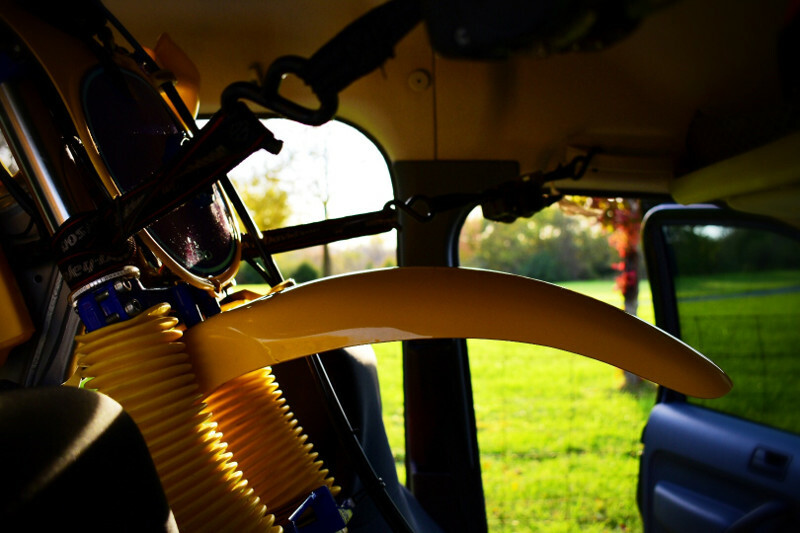 The van comes standard with two tie down brackets located near the back doors. To strap the front down, I use the existing grip handles (Oh Sh** Handles!) above the driver and passenger. It works out great since the handles sit level with the forks. The wheel chock and the seats secure the front forks and help with sway when turning. Of the bikes I’ve transported, I’ve never had to compress the forks or place the motorcycle diagonally. The bikes sit in the middle of the van, which makes it easy to load in and out. 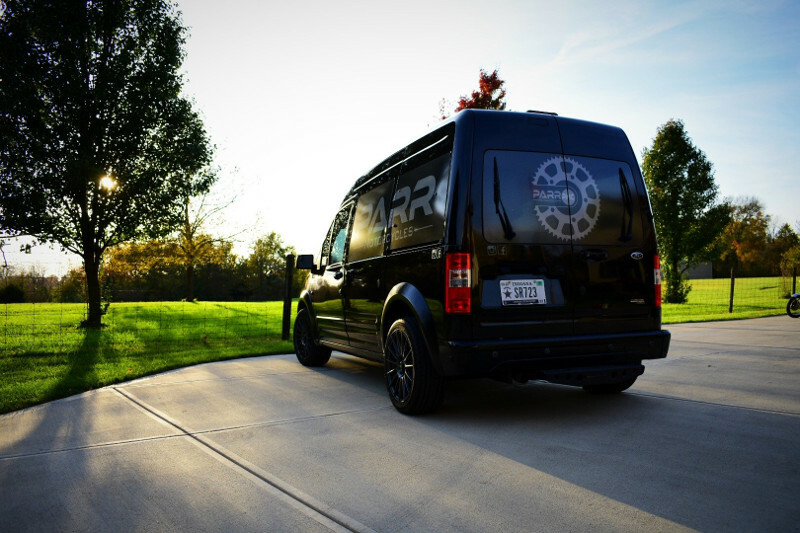 • What are some of the bikes you’ve hauled in this van? • What’s the largest bike you have hauled? The largest bike it has been able to haul is a 2009 Harley Davidson XR1200 (85” in length, 570lbs). This platform was built to handle the Harley Davidson XR1200 and bigger bikes, so I don’t have to worry as much about a bike fitting. When loaded, I’m able to even put more items in between the XR’s rear tire and rear door. The tallest bike I have been able to load is the Retro Moto DR650 at 47” tall. Even with my handguards, it has no issues fitting through the back door. Once inside, it has another 6+ inches until it touches the ceiling. • What’s the maximum bike length and height you think the van could haul? • Does the van have towing capability? I did install a tow hitch to the van. I have not yet tried to tow anything, but if I do, it will be a small trailer with one bike. The actual amount is unknown, as I’ve only found the towing capability for 2014 Ford Transit Connect to be 2,000lbs. The total payload for the 2012 Ford Transit Connect is 1,600lbs. • What kind of fuel economy are you getting? • Any big disadvantages to the van? The motor is a big disadvantage I can name. While its great on gas, the motor is underpowered. This is noticeable when reaching highway speeds or going up a hill. Great on gas but not on power. It’s a cut and dry kind of van, even with mine being the premium package. The build quality is subpar (built in Turkey) and it cracks and rattles. While the small size and compact Transit Connect is perfect for parking garages and fitting in small spaces, I do wish sometimes I was able to haul more than one bike at a time. I will be attending more motorcycle shows in the coming year, so a small trailer may be in my future! – Small in size, can fit in parking garages. – Low floor height — easy loading capabilities. – Tons of cargo room. – Reliable, haven’t had a single issue with it. • Any additional advice for prospective buyers/builders of this van? 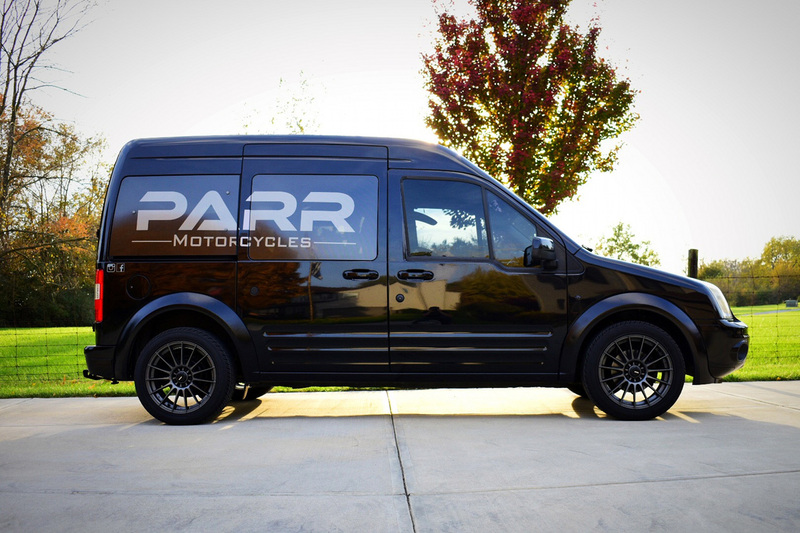 If you are looking for a Moto-Van with lots of cargo room, great on gas, easy to drive, small and able to fit in parking garages, this may be the ticket. While it’s a one bike hauler, you’re still going to have enough room to put other items, including loading ramps and more. If you don’t care about all the goodies and just need a motovan, I would purchase the cargo version. 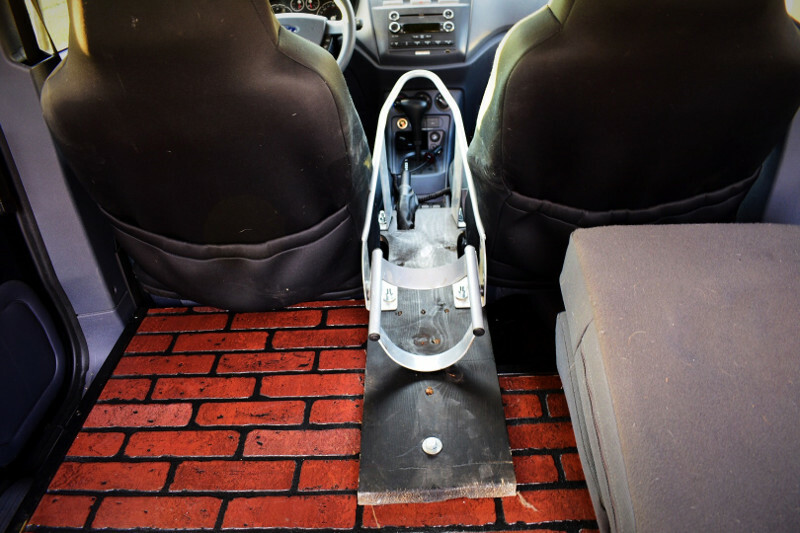 The floor runs all the way up to the seats and you’re able to build a better platform around the center console. I’ve used mine so much already and don’t have plans to make an upgrade yet because it’s a good daily commuter. In terms of building the van, it has so much potential. 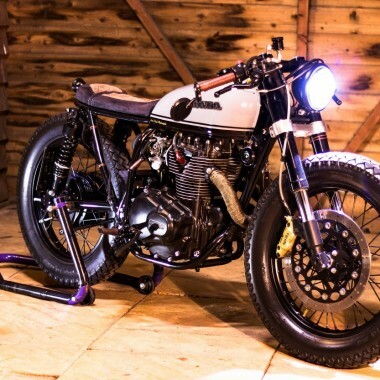 It’s a good platform to add whatever you may need for motorcycle related activities. I love the van, and also very amused at the owner’s concept of economical; The real transit over here in England will carry three bikes with ease and return 45-50mpg. Why do the Americans need such big engines in their vehicles, my last company truck in Canada had a 7 litre in it! Is it a compensating move…. Trust me, I wish we got those high-mph diesels over here! Love this addition to the site! Keep the haulers coming!